Isn't it gorgeous?! 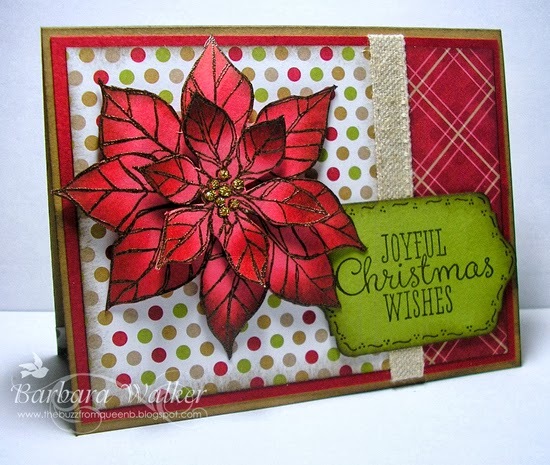 The poinsettias were stamped onto rose card stock and embossed with brown embossing powder. I cut them out and sponged each bract with red ink. I love the end result! It looks like the poinsettia is glowing; and that touch of gold glitter in the center adds a beautiful sparkle. The sentiment tag was stamped, lightly sponged and then I added a few hand drawn doodles to finish it off. That's all I have for today. Thank you so much for stopping by! All materials are from Stampin' Up! Oh so pretty, Barb. I really like the little touches you add, a bit of embossing, some sponging and, of course, the sparkle. Happy to hear you enjoy your stamp camps, too. Have a happy weekend! Barb, the brown embossing powder on the red cardstock is utterly fantastic! It's a beautiful combination. The poinsettia does seem to glow. The gold center is perfect. I love the doodles on the sentiment. This card is a true work of art!